AXYS Technologies Inc. deliver 8 oceanographic buoys to the Fisheries & Marine Institute of Memorial University of Newfoundland (Marine Institute ). The buoys will expand the existing ocean observing network, known as “SmartBay ”, located at Placentia Bay along Newfoundland’s southern coastline. The data provides fishermen, vessel operators, weather forecasters and other stakeholders near real time access to a variety of marine meteorological and oceanographic data. The Marine Institute plans to deploy the buoys in the spring and summer of 2013, with one 3 Metre buoy replacing a long-running station scheduled for a major refit. The delivered buoys include four 3 Metre buoys, two WatchKeeper ™ buoys and two TRIAXYS ™ directional wave buoys. 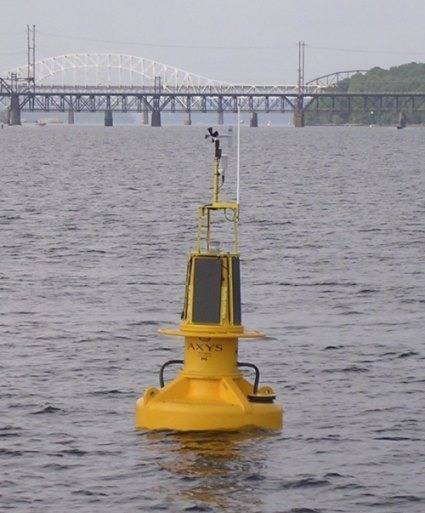 The large platform 3 Metre and WatchKeeper™ ODAS buoys have similar configurations to the systems previously provided to this program and will be established as permanent stations. The smaller TRIAXYS™ buoys will provide wave climate data in various locals and may be seasonal in operation. All systems are designed and built to withstand the harsh marine conditions experienced in coastal Newfoundland waters. The large ODAS buoys come equipped with various meteorological and oceanographic sensors to report synoptic conditions. The data collected/processed by the WatchMan500 ™ controller is then transmitted to a central data server via Iridium satellite or VHF telemetry. The 3 Metre and WatchKeeper™ buoys are fitted with a Type I Automatic Identification System (AIS) transmitter, which allows nearby vessels to access the buoy’s data. SmartBay began as an environmental monitoring demonstration project in Placentia Bay with the goal of creating awareness of the importance of better observing the marine environment. In 2006 AXYS supplied one 3 Metre buoy and in 2010 supplied an additional 3 Metre buoy and one WatchKeeper™ buoy. Real-time and archived data is freely available to the public. The data is used to develop custom weather and sea-state forecasts for Placentia Bay and is available here.